About this object Frederick Augustus Conrad Muhlenberg of Pennsylvania was elected the first Speaker of the House on April 1, 1789. With the outbreak of war in Europe President George Washington—with Congress’ support—famously declared U.S neutrality. The problems abroad threatened America’s trade, however, and Congress was forced to create the U.S. Navy in order to protect the nation’s merchants from the Barbary Pirates off Africa’s Mediterranean coast. Following the Jay Treaty with Great Britain, partisan rancor erupted again; many in Congress charged the administration with prioritizing commercial and diplomatic relations with England. On the domestic front, the anti-tax sentiment that spawned the “Whiskey Rebellion” in western Pennsylvania became a powerful influence in the formation of the country’s political parties. 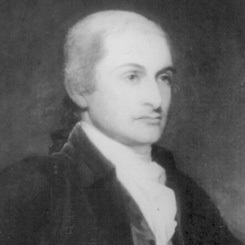 The House appropriated funds for Jay’s Treaty with Great Britain by a 51 to 48 vote. After a spirited debate, the House passed, by a 35 to 21 majority, the 1791 Excise Whiskey Tax.